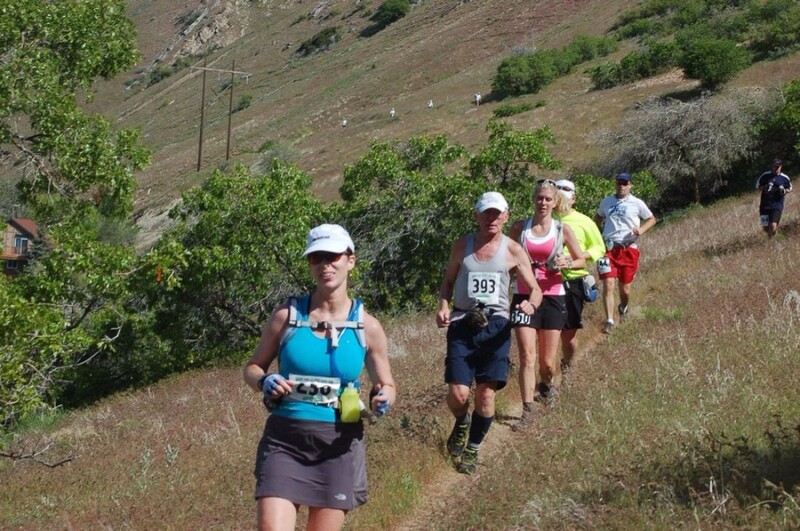 It is a very challenging, difficult and scenic loop course through the Wasatch Mountains above Provo, Utah. The trail will be marked. It consists of - dirt trails (43%), dirt roads (38%) and some paved (19%). The paved sections are: The first 2.1 miles from the start at Vivian Park down the Provo River Trail to the left turn onto the dirt trail. Then at the 22.7 mile mark, for 3.7 miles when you come out onto the Hobble Creek Road, and the last 3.7 down to the finish. There is over 14,000+/- ft. of elevation gain and loss, with 5 major climbs varying from 1100 ft to nearly 3000 ft. The first starts at mile 2.1. A series of climbs takes you up 2700 ft. over 5 miles to an overlook of Squaw Peak. Check out the Trail Map and Course Elevation Profile page to see what the course looks like. The last and most difficult climb takes you from the top of Berryport Canyon, to the high point of the course just before and above Windy Pass at about 9300 ft. Depending upon which topo map you look at there are two different trails in this section. On the 7.5 minute series (1:24000) the trail around peak x9297 goes around to the north. Both 30X60 minute series (1:100,000) maps I have used, show the trail going across the south face of peak x2834 (meters). The one on the south side is the trail we use on Race day by which time there should be little if any snow on this side, as you approach the high point of the course about a mile before Windy Pass. From here the course drops almost 4000 ft over the next 9+ miles back to the Finish at Vivian Park.